Ankle and foot joints carry the whole body; thanks to them we can stand up and walk. They are constantly used and often overloaded. So it is no surprise that they are subject to a high risk of injuries and other pathologies, which can affect various anatomical structures and arise under various forms. The menu above will allow you to explore the treatments offered at the Clinique Chirurgicale de Laval to treat various ankle and foot aches. The ankle is vulnerable and often injured. 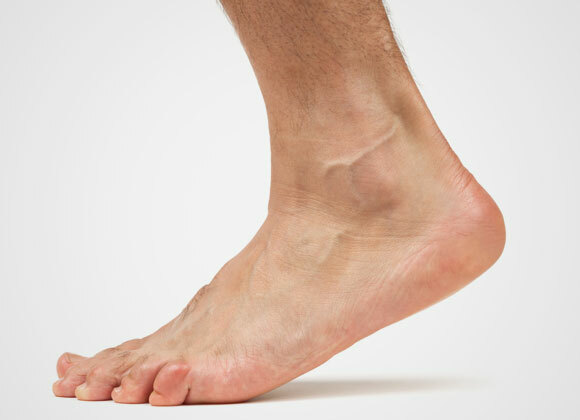 The bodys weight is entirely supported by the foot and the ankle. The ankle joint is like a hinge activated by large tendons. These sustain a fair amount of tension and can show signs of wear after repeated use (Achilles, posterior tibialis or peronneal tendon tendinopathy). Wearing a plantar orthosis, modifying your training regimen and /or wearing an ankle brace can be beneficial. More severe ruptures will be confirmed using imaging and can require tendon repair of the Achilles tendon or on the back of the foot. An ankle torsion can have significant consequences, even if ligaments generally heal well after a simple ankle sprain. Torn ligaments can create meniscal lesions or detached bone fragments (loose bodies or osteochondritis dissecans). A sprain can also create ankle instability after-effects when one has the impression that something is moving inside the joint. The ankle must be re-educated using proprioception exercises the moment pain is controlled and oedema is reduced using the application of ice, compression, elevation and rest. If pain persists more than 3 months, further investigation and imagery with a dye is necessary to visualize the inside of the ankle joint. Occasionally, we must visualize the inside, clean and remove damaged tissue using ankle arthroscopy. If the ankle is unstable, a tendon or ligament stabilization procedure may be needed. An ankle which locks and which becomes increasingly worn can develop tibio-talar or subtalar arthrosis. This pathology is very limiting and painful when walking. When the joint cartilage is damaged, there is no hope of regeneration and inflammation can be controlled using anti-inflammatory drugs, steroid infiltrations and rest. We must sometimes consider ankle fusion (ankle arthrodesis) or joint replacement (ankle arthroplasty). Foot deformities are complex and often represent a muscular imbalance influenced by having to support the bodys weight. The cavus foot must be investigated with caution. The flat foot can require support specially if it is not rigid. X-rays confirm abnormal angulations. Toe deformities (Hallux Valgus or Rigidus, claw or hammer toes) often make wearing shoes uncomfortable. Plantar pain can have different origins but they are differentiated by a clinical exam. They are usually Mortons neuroma or plantar fasciitis. An experienced clinician can counsel you because there are no miracle cures and no two feet are the same. Before considering surgery, you must rule out all the options because there is no turning back. The removal of nodules, cysts or neuromas can provide significant relief. The correction of toe deformities (metatarsophalangeal arthroplasty) is always a major surgery which requires time to adapt. Heel pain which finds no relief in infiltrations or with insoles, can sometimes require a plantar fascia release surgery.